Adding to their impressive collection of super talls currently being worked on in China is Kohn Pedersen Fox Associates design for Ping An International Finance Centre in the city of Shenzhen. The scheme is being built by and for the insurance company that have lent their name to it as its new headquarters with the first eleven floors of the building serveing as a new shopping centre. The building will reach a grand total of 648 metres in height making it the tallest building in the Peoples Republic beating Gensler's under construction Shanghai Tower by 16 metres. It also marks the latest part of the on going competition between Shenzhen and Shanghai for the tallest skyscraper in the country - something they have been battling away at since the early 90s. The building height though reaches its pinnacle thanks to a an elegant spire coming off a tapering top quarter meaning that the Shanghai Tower will continue to have a taller roof. Helping the structure are two super columns on each side of the tower that have been engineered by Thornton Tomasetti - these are required as the taller a building the greater the area that the faces of it can take up, and thus the greater the load that the wind can put on it. 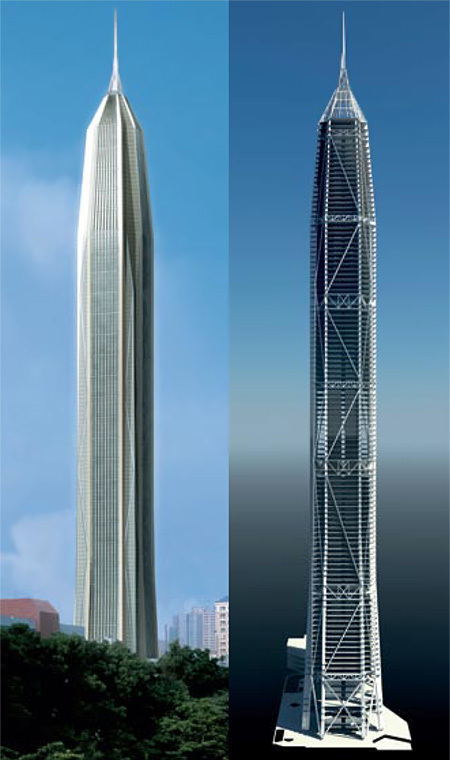 It's also for the purpose of reducing wind loading that supertall towers such as the Ping An IFC are usually aerodynamically styled. 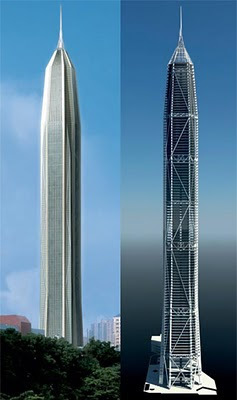 If the Ping An IFC does go ahead, then the scheme is scheduled to be completed in 2014.